George Walker was behind the 1949 Ford design but he originally intended it for Nash. Independent automobile stylist and industry consultant George Walker and his team were behind the groundbreaking envelope that would become the first post-war Ford. With sketches of the proposal under his arm, Walker began the rounds to sell it to one of the manufacturers. 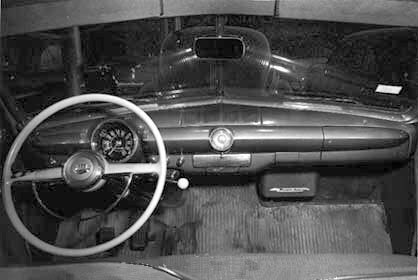 That was a common practice at the time; few of the automakers operated their own styling departments. Even those who did often sought outside designs to keep the in-house staff on its toes. 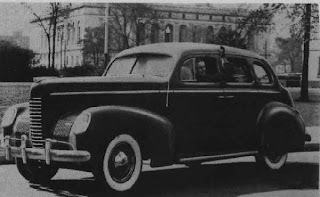 Walker made an appointment with George Mason at Nash-Kelvinator and drove out to the company’s Art Deco headquarters on Plymouth Road. Mason was enthusiastic about the design; the slippery smooth envelope was exactly the direction he envisioned for Nash. George Walker designed the 1939 Nash. Walker was well known and well liked at Nash. He had designed the striking 1939 models for the company. They had captured the public’s fancy, giving Nash a very good sales year. When Walker left Mason’s mahogany paneled office, Nash’s CEO was under the impression that the design would be purchased from the talented stylist. Walker waited but no deal was ever signed. With no follow up from Nash, he finally took the sketches to Dearborn for another presentation. Ford officials were impressed. They handed out the basic package criteria and ordered competing designs, one from Walker and another from in-house stylist Bob Gregorie. Walker decided to submit three proposals. Created on a shoestring, it is true that one of the three quarter-scale clay models was cured in the kitchen oven of Walker’s associate, Richard Caleal. Reportedly, the drying clay stank up the house. 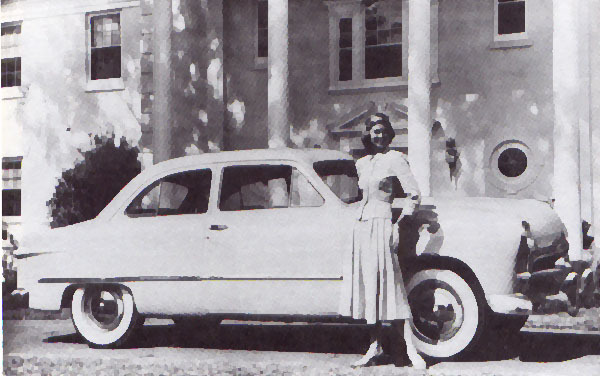 The four completed models were shown to the top brass on August 1, 1946, Ford executives chose Walker’s design and signed a deal. When George Mason learned of the foul-up, he was furious. 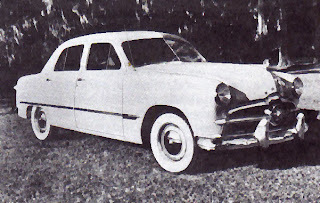 The proposed new 1949 Nash had somehow slipped through Mason’s fingers and would now wear a Ford badge. Mason’s response was to make sure that such a disaster never happened again. He established an in-house design team for Nash but that is another story for another day. and weighed in at 3,110 pounds. With contract in hand, the Ford began to take shape. Walker worked under the direction of Harold Youngren, Ford’s Vice President of Engineering. The wheelbase stayed the same as those of the previous Fords but that was about the only similarity with the past. The new model was three inches lower. Because of the smooth, slab-side configuration, the car appeared to be narrower. In fact, it was. It was also lighter in weight. When it was complete, the 1949 Ford was no more similar to the 1948 model than fresh-squeezed Florida orange juice is to Tang. The grille was understated; a simple chrome bar split at the centre by a graceful round, chrome circle. A free-floating fuselage was housed within, giving off more than a suggestion of flight. The trailing edges of that bar reached beyond the heavily chromed grille housing to hold the parking lamps. The slab-sided look was applied to the rear of the car where it was punctuated with ovoid taillights housed in a small fin-like protrusion. Instrument panel was clean and sported a large, round white-on-black speedometer. The four-door sedan was originally designed with both doors latching on the centre post. At the last minute, the “suicide door” setup was nixed for the more conventional arrangement. Promotional models had already been shipped to dealers with the discarded configuration. From drawings to production, the Ford was in gestation for only 19 months. That was an incredibly short time frame. Normally, new car development took a full three years. The investment was heavy: an estimated 10 million man-hours and $72 million in cold, hard cash. 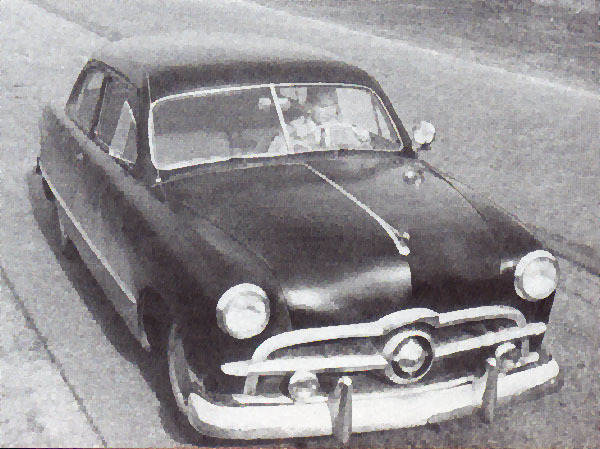 Neither the six- nor eight-cylinder engines changed a great deal from the 1948 Ford offering. Engineers did make improvements to the cooling system and breathing was improved. Despite the tinkering, the horsepower remained unchanged at 100. It was more than ample; the new Fords were considerably lighter than their predecessors. Traditional torque tube drive was dropped in favor of the Hotchkiss arrangement. What was really new for the Ford was independent front suspension and longitudinal leaf springs supporting the rear axle. The all- new car was given a ladder-type chassis. To get a jump on competitors, the new 1949 Fords were shown off to the press on June 8, 1948 at the Canadian National Exhibition in Toronto. Hundreds of reporters flocked to the event at the Automotive Building. They fell in love with the design and wrote glowing accounts for the public. Like the convertible, the Ford Custom Station Wagon was imported from the United States in 1949. With a keen-edged hunger for anything new, consumers flooded Ford dealers’ showrooms during the first three days they were on the market. The nine glittering models were the stars of the show. Absent from the lineup was a hardtop convertible; there simply wasn’t money to tool one. Station wagons were offered in two-door configurations only. Ford did not have an automatic transmission to offer that year because the deal to purchase the self-shifting units from Studebaker fell through. Those who came out to see the Fords did seem not care. To them, the only thing that was the same as the year before was the air in the tires. Customers promptly placed orders for the sleek machines. Fleet and nimble, the new Fords were the darling of many a police department, too. The bold, expensive gamble paid off handsomely as 1949 would turn out to be a very gratifying year for Ford. Production in Windsor for the long model year reached 38,280 units. Those old cars are unique. They have unique design so that it looks different with modern one. It seems to be interesting to have one of the old cars above.